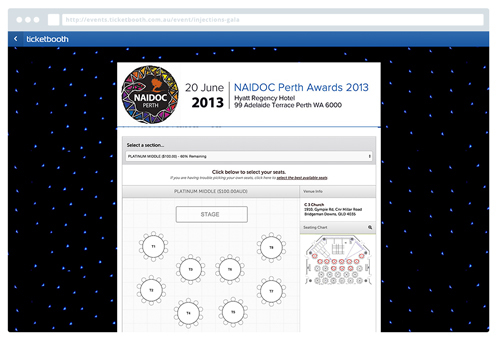 Reward attendees with discounted tickets for sharing your event on their favourite social networks. Don’t let anyone forget about your fundraiser by setting up automatic email blast that remind people about your event. Ticketbooth charges a low per ticket fee, per ticket sold – so no nasty surprises for your or your attendees. 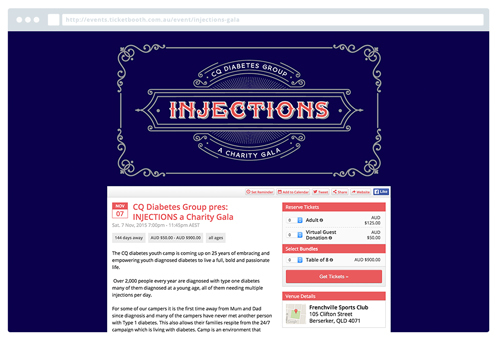 Custom brand your event page to suit your cause and help drive your ticket sales with a beautiful event page. Ticketbooth’s array of promotional features makes selling tickets easier than ever before. Create a buzz around your event by offering customers a number of simple and effective coupon options. Ticketbooth allows you to accept an optional donation alongside ticket purchases for attendees that want to contribute more. To get the most likely donators to your event it is imperative to track your marketing efforts and ensure your message is getting to the right people. When you sell tickets online with Ticketbooth you’re backed by a knowledgeable support team that will advise you on best practices and provide sound advice. We understand that things go wrong, that’s why we have a custom support centre to manage customer support, phone sales and enquiries. Need to change a ticket price or description? Everything can be changed via our ticketing admin, giving you full access to your sales 24 hours a day.